EasyLED board contains 8 surface mounted LEDs with low power consumption and two IDC10 header connectors. 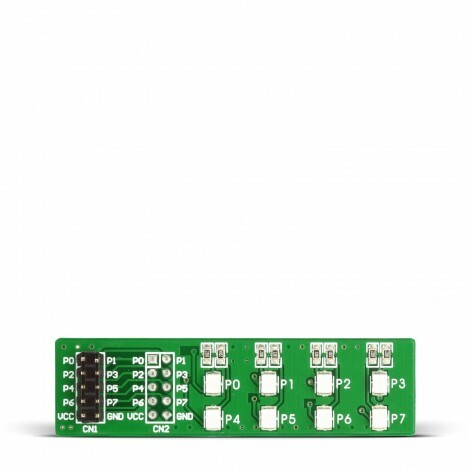 EasyLED board contains 8 surface mounted LEDs with low power consumption and two IDC10 header connectors. CN1 is male, and CN2 is a female header, compatible with mikroElektronika development boards. EasyLED is small in size, well marked, and perfect for adding LED signalization to your prototype. Board comes in three flavors: with red, green or yellow LEDs. Applications The digital potentiometer can be used in audio equipment (volume and tone controls), communications (line impedance matching), instrumentation (gain, offset adjust), LCD contrast control, programmable filters, etc.